Once upon a time, there was a local festival call Fantasia. A gentleman George Mosley put it on every year for 11 years,1977 to 1987; everyone loved it. We were all very disappointed when he decided to bring a halt to Fantasia Festival. Where would we dance, what would we do? 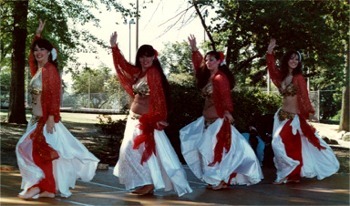 It was the event of the year, the first belly dance festival in Washington. One night after dancing at a local Greek night club, Georges bar & grill… Saroya drove Circe home. During our discourse about the evening, Circe beings her next sentence with, “we could do a festival we have a park.” Now mind you Saroya’s doing the driving, she looks at Circe then remarks, “who do you think I am, Judy Garland, and you’re Mickey Rooney?” With a quiet smile a twinkle in her eyes, Circe say “yes”. The year, 1987. Next those two conspirators discuss it with litter mates, Sian and Charanni; everyone agreed it was something we could do. Between the four of us there was more than 150 years of dance experience... not to mention all those years of being stage crew for this show or that show, the master of ceremonies, runners, performers, all around crazy people. Saroya is filled with guilt; she helped out at Fantasia for 10 out of the 11 years. She feels loyal to George and does not want to cause any problems. Saroya was a mess over this for a while insisting on going to George Mosley to clarify that he truly is finished. That he has no intention of putting on his festival again. George assured Saroya and Circe that he was indeed finished (Saroya, the chicken insisted on Circe going with her). George advised us of pitfalls we thanked him then off we sprinted. A promise was given to him that should he change his mind, Da Bab’s would not do a festival. Park manager John was next on our list. In order for us to do this, we needed the park’s cooperation. The advisory council agreed they would take fees from table sales; this was before we had allocated spots. The lucky Bab’s would get the use of the park grounds, rooms for changing and a stage, for two & half days. The park has to be staffed by an employee, for a few years we (Circe) (did ya see that royal we) saved them money because she was a park employee at that time. The park manager eventually decided they needed someone just for the park. 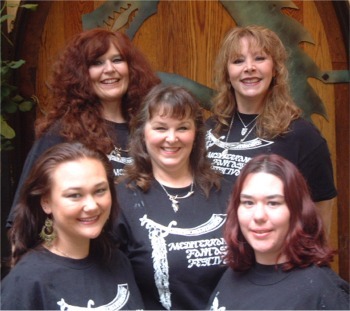 It was becoming too much responsibility for us, and too much work for Circe running the festival, vendors and park. We supply everything else. Sound, all direct festival help, at first our families, children, a couple husbands, a few friends, did all the set up and tear down, operating and running of the festival. It is still family, friends, we and now a few dancers who do the work. After the first couple of years more and more dancers, starting staying for tear down… those wonderful women and their friends. We are ever so grateful. As the planning progressed we decide we needed a money base. We started paying $20.00 a month each for as long as we could… that lasted about a 6 months, we are all essentially broke… we realized that we couldn’t fund it entirely alone. We just were not rich enough. We started tossing around the concept of a registration fee. We argued about it, agreed, disagreed, laid on the floor during rehearsal and agonized about it. How could we ask this of other dancers, we weren’t so fond of it ourselves… but our choice came down to asking a registration fee or no festival. We cannot fence the park and charge admittance; the city of Seattle would take that, because they own the park. The money from the vendors stays at Hiawatha and goes to children’s programs. I believe we bring in the most money to this park of all their money making extra events. Thank goodness, they like us, and are as excited about the festival as we are. The first year we all kicked in what money we could. Talked to the park, and got our festival going. 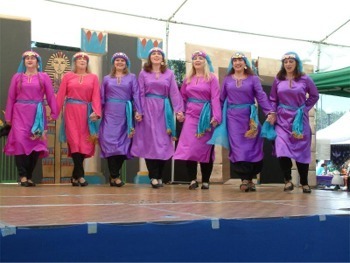 One day, 12 to 5 pm.. We danced twice… for more than half the life of the festival, “ DA BAB’s” were still funding a major part of it and on occasion we still are out of pocket for things we do or need. Mediterranean Fantasy Festival almost pays for itself though not entirely. We are still out of pocket for some expenses, and our time is donated. Something will always come up, and whoever is handling it, pays for it, then is reimbursed…most of the time. We have never taken a wage or even thought about it. Though once or twice a hubby will wonder why we do this for free.. We do it, we do because we love it, we wanted somewhere to dance… there are now so many dancers we rarely get a chance to dance. We schedule ourselves in, and then take ourselves out in order for someone else to dance. 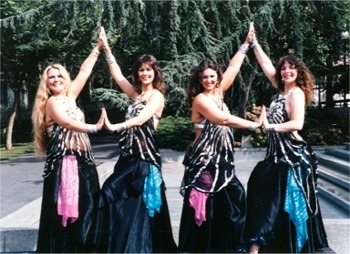 The Mediterranean Fantasy festival may be run and operated by the Babylonian Ensemble, our names may be what you see on the flyer, but the dancers “are” the festival, the dancers help pay for it to exist each year, the people who attend, donate time, or help, they are the festival… we are the front women… it may have started out ours, but it now belongs to everyone who has ever danced or ever attended..
We love you, hope to see you this year and thank you.